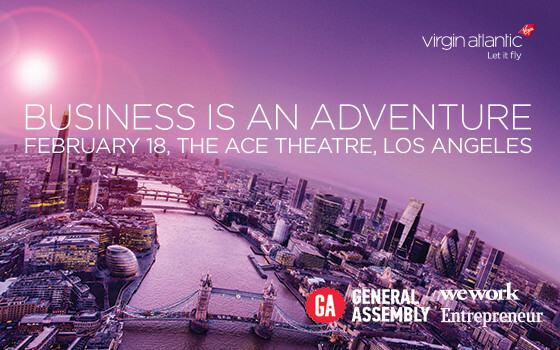 We’re giving away 50 tickets to Virgin Atlantic’s sold-out Business is an Adventure event, happening at the Ace Hotel Los Angeles. On Thursday, February 18, Richard Branson and a panel of LA’s best and brightest business leaders will explore 'Why Simple Solutions Cross Borders,' and how no-brainer ideas can rock the world. Enter now for your chance to win a ticket. Like Virgin Atlantic, we believe business is an adventure. That’s why we’re excited to be a partner on their mission to uncover how today’s business leaders make that adventure epic and reveal how businesses can thrive on the global stage. To kick off its Business is an Adventure Entrepreneurial Series, Virgin Atlantic is gathering some of LA’s top movers and shakers to talk with Richard Branson about the power of keeping things simple. The panel will also advise emerging Los Angeles startups who have yet to tap into the global market. Need more reason to register? All guests will receive a tuition credit toward our course in data, design, technology, and business, as well as a one month’s complimentary access to the WeWork community, to help them on their own adventures.